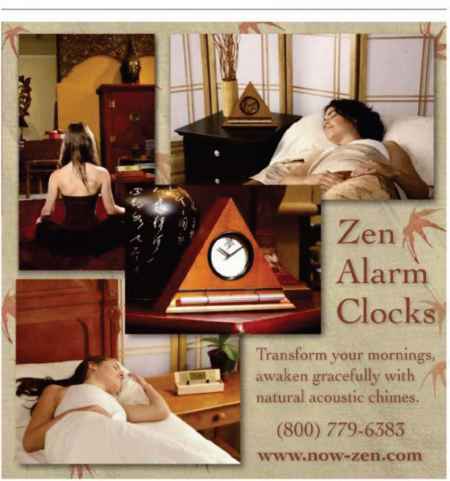 Transform your mornings awaken gracefully with natural acoustic chimes. Corn is one of the yoga world's biggest champions of service. In 2008, she co-founded Off the Mat Into the World—a grassroots organization that raises awareness and funds for international causes. The program offers an annual Global Seva Challenge, a fundraising effort that has raised more than Si million for communities in need. Participants pledge to raise $20,000 from their local communities during one calendar year. If they succeed, they arc rewarded with a trip abroad to work as humanitarian aides alongside Corn. In 2009, Off the Mat worked in Cambodia; this year, participants went to Uganda. The current challenge is to raise money to help people with AIDS in South Africa. Beryl Bender Birch, one of the First Americans to teach Ashtanga Yoga some 30 years ago, is delighted that service is a part of so many people's practice today. The creator of Power Yoga has always required her teacher trainees to engage in some form ofservice. In 2007, inspired by the efforts her students were making to serve, she founded the Give Back Yoga Foundation, which gives grants to support seva projects withi n the yoga community. Carmel Wroth is a lifelong student of yoga and an associate editor at Yoga Journal. YOGA JOURNAL Issue 231 (ISSN 0191-0965), established In 1975, is published nine times a year (February, March, May, June, August, September, October, November, December) by Cruz Bay Publishing, Inc., 475 Sansome Street, Suite 850, San Francisco, CA 94111, (415) 591-0555. Annual Subscription: U.S. $21.95; Canada $28.95: overseas $43.95. Single copies U.S. $4.99; Canada $6.99. Agreement number 40063731 assigned by Canada Post. Mailing list: Occasionally, we make our subscriber list available to carefully screened companies unless the subscriber advises us otherwise. Send all subscription matters and notices of changes of address to: Yoga Journal, P.O. Box 51151, Boulder, CO 80322-1151. E-mail the subscription customer service department: yoqajournal ^emailcustomerservice.com. Call subscription customer service, Mon.-Frl. 7 am-10 pm CDT; Sat. 8:30 am-5 pm CDT: (800) 600-9642 or (303) 604-7435 from outside the United States. All issues of Yoga Journal are now available on microfiche from ProOuest, 300 N. Zeeb Rd., Ann Arbor, Ml 48016. Copyright 2009 by Cruz Bay Publishing, Inc. All rights reserved. No part of this publication may be reproduced without written permission from the publisher, yoga Journal is not responsible for advertising claims. Periodicals Postage Paid at San Francisco, CA, and at additional mailing offices. POSTMASTER: Send address changes to: Yoga Journal, P.O. Box 51151, Boulder, CO 80322-1151. CANADIAN UNDELIVERABLES: Send to Station A, P.O. Box 54, Windsor, ON N9A 6J5. The editorial content of Yoga Journal should not be used as a substitute for professional health care. Talk with your doctor before starting any new exercise regimen. 3 month subscription only $99!